Join us for a hands-on workshop where you’ll learn how to create collaborative learning environments based on user research, learning design principles, and library redesign trends. In any community, few institutions offer more open doors than a library. 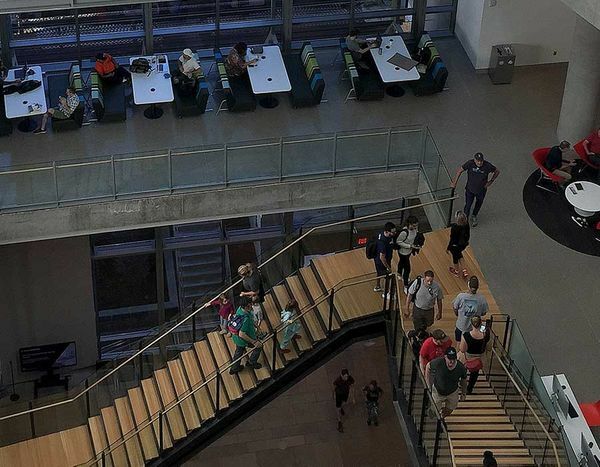 With physical spaces open to the public and internet-enabled computers that grant access to a world of information, libraries hold incredible promise in the digital age. Join us to learn the design elements that many libraries are incorporating to transform the stacks into open learning environments that people of various ages, abilities and backgrounds can use to collaborate on ideas and develop relevant, 21st-century skills. In this hands-on workshop, we’ll present attendees with a drawing of a library, along with characteristics of the community it serves. In small groups, attendees will brainstorm learning design interventions that could help transform this space into an environment that facilitates skills development and collaboration. After this activity, we will present research-based learning design interventions that could be applied to this space, and we will show how these same concepts could also apply to other types of community spaces, such as corporate training areas. Finally, we will present examples of real organizations that have incorporated these concepts into open, collaborative spaces and the learning outcomes they have achieved. Attendees will leave the workshop with a clear understanding of key learning design principles and their applications. Monica Giannobile is an M.S. Ed. student at Purdue University, where she studies learning design and technology. Drawing on a decade of experience in marketing and communications, she designs experiences that help learners of all ages enrich their lives, explore their interests, and meet their goals. Learn more about her work at SkillsThatStick.com or connect with her on LinkedIn and Twitter.